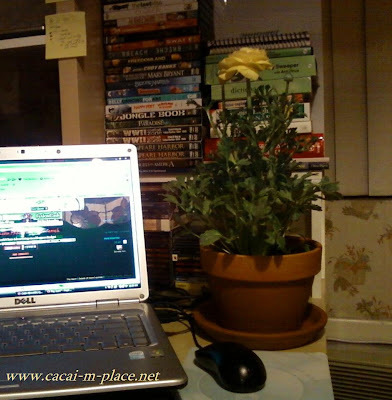 The above images speaks for itself, yellow stuffs great for "Mellow Yellow Monday" meme entry. I finally found the yellow corn holder after I saw from one of my virtual friend post which also gave me "pasalubong" from her recent vacation trip in Philippines (her and my home country). 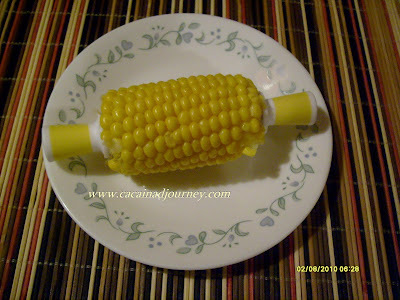 I was amazed of the corn holder that was why I was anxious to have one because I love to eat corn. I am really glad to have it. The fresh yellow flower in a pot with saucer is called "Ranunculus" or "Ranunculus Asiaticus" as its scientific name. That was one of the fresh flower (the other one has red color flower) I had during Valentines Day celebration. That time some of several petals did not bloom yet but this time the first one of each plant (one for yellow and one for red) bloom already. And I could never be happier chasing as it blooms one by one. I placed it near at the PC and the other one is near at the center table. Happy Mellow Yellow Monday, cute post. Kalami ngatngaton sa imung maiz tsang oi, I missed my YMY yesterday uy. tapuls mn gd. nice kaau ang imong entry madam sis....tapos ganahan ko sa imong corn holder...ehhehe...cute kaau! paingkit ko b?